» Advertisers may not cancel orders for, or make changes in, advertising after the closing dates. » Orders for all premium positions are noncancellable. » Orders for ROP positions are non-cancellable 30 days prior to closing date. » The content and design of all advertisements are subject to the Publisher’s approval. » The Publisher reserves the right to suspend, omit or move any placement at any time should the need arise. 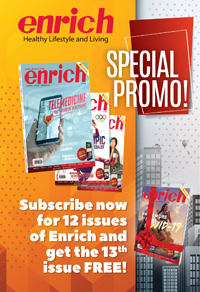 With a winning design presentation, top quality editorial content and striking photography, ENRICH brings to the market a new standard and definition to custom publishing.